Swaheed Kanaklata Barua was one of the leader in Assamese women in Indian independence movement. She was from Barangabari under Gohpur police station in the district of Sonitpur (previously Darrang). She was gunned down by the British armed Police along with Mukunda Kakati in front of Gohpur Ploice Station in 20 September1942. She was born on 22nd December, 1924 at Barangabari in a conservative family called 'Dolakasharia' family under Gohpur Police Station. She became orphan at the age of 5 and perhaps because of her helpless position, she bore a responsible mind since her childhood; and those responsible and dutiful charter on her part ultimately inspired her to dedicate her life for the cause of the nation at the prime of her life. Karneswar Hazarika and Mukunda Kakaty. These leaders inspired the local people with the slogan of Gandhiji 'Do or Die'. Shaheed Kanaklata Barua, who took the leading part in the programme chalked out by those leaders for 20th September, 1942 at Barangabari and ultimately became martyr on the said day, was an unsophisticated village girl of 18 years. Kanaklata barua got her name enrolled in the volunteers force organized for the purpose of hoisting the Indian national flag at the Gohpur Police Station on 20 September, 1942 without the knowledge of other members of the family. In the early morning of 20th September, like the other days, she completed her domestic works and took meal with her younger brother and sisters, telling them mournfully that she might not be able to come back alive and then she went out and joined the picketers at Barangabari Chariali. She stood at the head of the women volunteers line with the national flag in her hand. On receipt of the signal from the leaders, the volunteers, two in line, male and female proceeded towards the Gohpur Police Station about 12 KM from the spot. The aim of the volunteers was to hoist the national flag at the British dominated police station, following Gandhiji's principle of non-violence. They were joined by many other volunteers at different places on their way to Gohpur and all of them were shouting the slogans, 'British imperialists should go back', 'Freedom is our birth right' etc. Gohpur Police Station is situated at a distance of about 11/2 KM from the gate of New Purubbari tea garden owned by a native entrepreneur. The volunteers took rest at the place for a while and they were made aware by the respective team leaders of the dangers likely to be faced by them in front of the Thana gate. The leaders asked the female volunteers to be behind the line, but Kanaklata strongly opposed the suggestion, by saying that they would not be at the back of the line, if necessary, the women volunteers would sacrifice their lives for the cause of the nation. This immortal speech of Kanaklata on the verge of her imminent death inspired the minds of thousands of male and female volunteers of the day and made them forget the dangers likely to be faced by them in front of the Thana. Shouting the slogan 'Do or Die' they reached the Thana and made queue before its western gate. At the same time, volunteers from the eastern part of Gohpur like Kalabari, Kamdewal, Dubia etc. led by the local leaders like Golok Pujari, Nirod Boran Das, Chandra Bardoloi, Mineswar Kakaty, Uma Bardoloi, Bhbaneswar Kakaty, Thaneswar Bora and others reached the Thana and made queue in front of the eastern gate. The police force led by R.M. 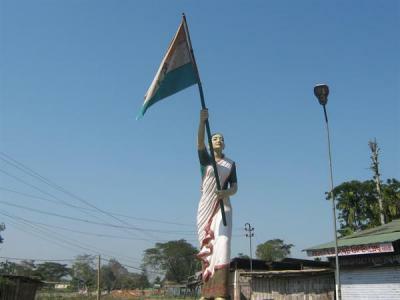 sunia surrounded the western gate and did not allow the picketers to enter the compound to hoist the flag in spite of repeated request from their side.In the meantime, Kanaklata with the national flag in her hand tok her position at the head of the line of female volunteers and tried to convince the policemen by saying that they came to achieve their noble object of hoisting the national flag at the Thana for the cause of the nation, following Gandhiji's teachings on non-violence and that they would go back after discharging their noble duty. This argument of Kanaklata could not stop the Britishers from preventing the picketers from entering the Thana compound. But the police force prevented the volunteers by pointing their guns towards them. Ultimately Kanaklata to enter the compound by pushing aside a gun in her hand, saying that they could kill their human bodies but not their soul which is made of iron. She also said that whatever measures the Britishers might adopt to prevent them from doing their duty, but they would proceed. This immortal speech of Kanaklata gave inspiration to thousands of picketers of the day in the eve of imminent danger. The police force opened fire at the unarmed picketers without any prior warning and Kanaklata was gunned by one constable Gogal Chipahi by name, next round of firing caused grievous injury on the head of Mukunda Kakaty, who sccumbed to it on the same day at 8 p.m., and also injured many other volunteers like Hemakanta Bora, Thuleswar Rajkhowa, Bhola Bardoloi etc. Kanaklata died on the spot. But this brutality on the part of the imperialist could not stop the volunteers from achieving their goal, and ultimately, one Rampati Rajkhowa of Kamdewal hoisted the national flag on the Thana building in the evening of the same day without the knowledge of the British officials of the Thana. The body of Kanaklata was brought to her home at Barangabari and cremated at her own land there. Mukunda Kakty was also cremated on the same night. Kanaklata is no more with us, but the sacrifice of her life for the cause of freedom of our country has remained a great source of insperation for thousands of indian women. Kanaklata can be compared with Rani of Jhansi who sacrificed her life for the cause of India's freedom at the time of Sepoy Mutiny and also with Zoan Ark of France. let us remember the great martyr after 50 years of her death.